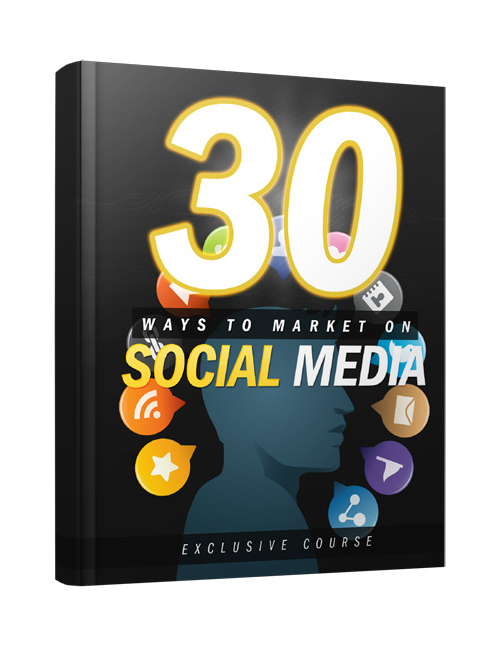 30 Ways To Market On Social Media is your premium take action guide that will give you everything you need to take full advantage of the top notch social media marketing tool to drive your rank, conversion, and online credibility up through the roof and beyond. There are a variety of ways for you to gain tremendous traction and brand recognition using various social media channels. Even if you don’t fully grasp the concept of social media…you will eventually. All you need to do is decide to take the bull by the horns and grab this credible professional e-book to help you reach the top of your hot niche sooner rather than later. How does that sound to you? Seriously, if you want to win in online business you MUST have the knowledge in your head to make use of the tools that will help get you noticed and drive you to the top. Social Media is here to stay and it’s growing by millions of users yearly. If you can figure out how to make it work for you, then you’re golden. So let this guide show you the way! 30 Ways To Market On Social Media is your perfect prime solution. Get it now and I promise you will head straight to the top! It’s always good from the very top.